Polar Bears live only in the Arctic and in zoos. 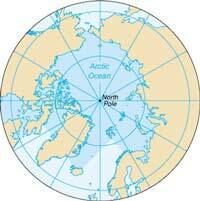 The Arctic is the large area at the top of the world stretching around the North Pole down to the Arctic Circle (one of the lines of latitude drawn around the earth on maps). There is ice nearly everywhere at the Arctic, and there are several types of it. Polar Bears roam on pack ice covering the Arctic Ocean, swim between ice floes and ride on them out at sea, and they walk over the frozen tundra onshore. These bears are strong, fierce animals and are very good at swimming and diving. Scientists think there are about 20,000 Polar Bears living in the Arctic today. Most of these are in Canada, Greenland, Siberia and Alaska, with a smaller number in Norway. About 250 Polar Bears live in zoos around the world. 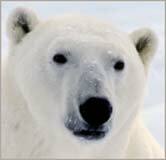 Polar Bears are the most aggressive of the bear species, but they are threatened with extinction.